Let's celebrate our mom's by bringing them to hear one of the best sax players in the world. Brian Lenair! 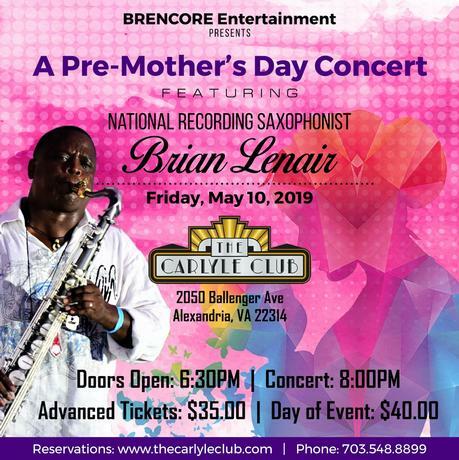 Brian is one of DC's greatest saxophonist and we are excited to have him perform at the Carlyle Club. Make the evening special by inviting your family for a great night of music. Spread the word and make your reservations today! This event will sellout. "Music is not just my vocation, it is my passion and it is my calling. No matter how intimate or large the settings, I always play with the same energy," says jazz saxophonist extraordinaire, Brian Lenair. For nearly 30 years, national recording artist, Brian Lenair has built a reputation for jazz enthusiasts both domestically and internationally. Brian started his solo career in 2004, after being the serenading saxophonist and front man for Washingtonbased group, Spur of the Moment. While with Spur, he astounded audiences with a unique style and mixture of jazz and R&B for over 15 years. During that time, the group recorded two well-received CD projects, with Brian prominently featuring his talents as a musician, producer and composer. Brian has independently produced five CD projects. He will release his long-awaited sixth project November 2017, entitled “Underground, Volume 3: The Cover Story”. The project features a collection of some of the greatest chart topping cover songs. The audacity of sound that Brian uses to convey Childish Gambino’s “Redbone” will amaze listeners. This project also features a lovely melody that he wrote and composed after the birth of his only daughter, entitled, “A Father’s Love”. He also covers one of the hottest artist in 2017, Bruno Mars’ “That’s What I Like” and his rendition will be just what you like. Then he has incorporated some DC hometown flavor as he pays homage with a co-written and co-produced track entitled, “Funky Dougout”. Brian has not missed a beat since his last project in 2010, when he stepped center-stage with “Eye of the Storm”. That project charted number 14 on Billboard, which was relatively unheard of for an independently produced project. Brian has an undoubted flair for contemporary jazz, gospel, R & B, blues and funk. You will totally appreciate the groove and celebrate musicianship when you hear him on this new project. He has played with some of the greatest recording artists and musicians of our time. Brian is a nationally endorsed saxophonist with Sax Dakota.